Breaking news! Today I am shoveling out the sewing room sorting my possessions, including those stashed carefully in the deepest corners of my sewing room, and I found the colour-work knitted vest I started in the fall of 1985! The only things missing are the buttons and the garter stitch bands for the arm openings. I knitted the bands, just didn't sew them on. I think I stopped so close to the finish line because it didn't fit as illustrated (see below) and the closer fit didn't suit my 80s sensibilities. I could probably block it a bit bigger, but now the fit seems just fine. I inspected it with the benefit of additional decades of life (if not knitting) experience during which time I have become far more picky. I am impressed by the knitting. My tension was great and the floats on the back are nice and relaxed. However, I did a bad job on the assembly. I wouldn't choose these colours if I was starting this project today, but methinks I'll resew it to meet current quality control standards chez The Sewing Lawyer, and finish it (finally). 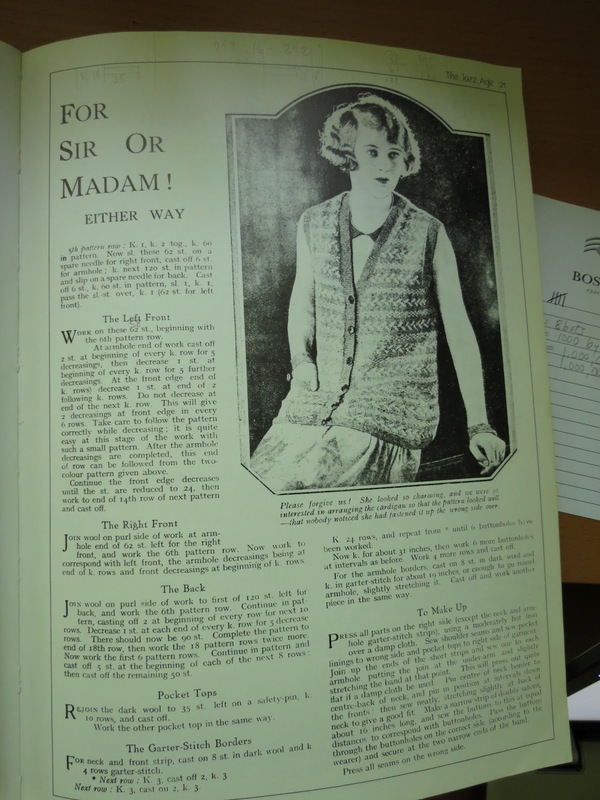 The pattern is "A sleeveless cardigan for Sir or Madam" from The Man's Knitting Book - classic patterns from the '20s to the '50s by Jane Waller, now out of print. If you come across it, it's a really nice collection. This pattern is from the roaring '20s. I'm working on my latest dress (yes, yes, there has been progress) and, as usual, have needed to try it on periodically. This one has a side zipper. I haven't done a lapped zipper in any location, let alone a side-seam zipper, since before the turn of the century. It went in OK and all that, but the combination of a side zipper, not extending right into the armhole but just below it, and a close-fitting skirt means that this dress is not easy to get into. Which worries me about whether I will like to wear it. Which in turn leads me to ponder what exactly it is that makes a sewing project a real hit. If we can identify the magic criteria, I could perhaps ensure that I'd have more hits and fewer misses. Not that I have an indecent number of misses. But there are definitely items that I turn to again and again, and those that stay hanging in the closet. Have a look at these jacket projects, which all date back to 2007. I love this jacket. I wear it constantly in the winter, along with the simple bias-cut matching top. In fact I've made the top (Vogue 2683) so many times I lost count. 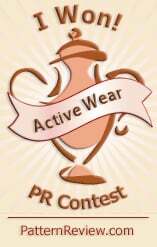 I wear the pair with a long pale grey skirt or with plain brown wide-legged pants. What I love: The fabric - the leaves are woven into the fabric - purchased at Tissus Tuéni in Montreal. The colours - mix of warm brown and beige, and cool greys. The fit. The piping. The collar. I like being able to throw on the jacket and top for an instant ensemble. I like being able to take the jacket off if I overheat. 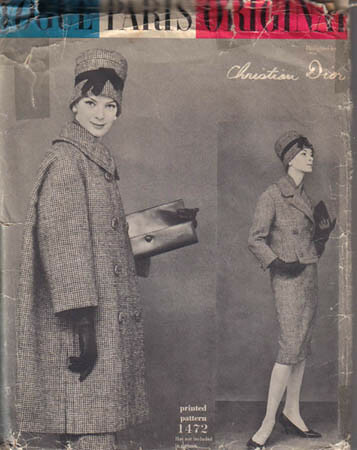 Next, what about this jacket, made from a vintage Vogue Paris Original Christian Dior pattern, found (uncut and including the Vogue label with the Eiffel Tower) at the Fabric Flea Market one year? I made a skirt to mimic the one in the pattern but with some room so I could actually walk, climb stairs etc. This is a very feminine suit, but still (am I deluding myself?) powerful. I wear it often with a little shell. A jacket and sleeveless top combo is very practical in my office. Unfortunately, doing a great job sewing-wise isn't the ticket to a hit for my closet. 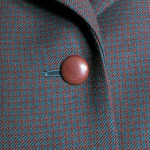 This jacket fits, it's well-made (more pictures here), and it combines orange and teal in a tiny woven-in pattern. I love the colours and lined the body with orange silk. However from a distance the colour is less interesting, and the jacket fabric is a little stiff. I think it is a wool blended with some synthetic. The stiffness carries into the very structured collar (I think I used a fusible hair canvas) which fits very close to my neck at the sides. This isn't completely uncomfortable but detracts somewhat from the feel of the jacket on. There is an unsuccessful matching skirt, which is seamed in a way that makes it impossible to turn into something else, unfortunately. So the jacket is a bit of an orphan. That's a problem. I like it, in theory. However it doesn't get worn very much. Do these garments reveal anything to you about my style and preferences? 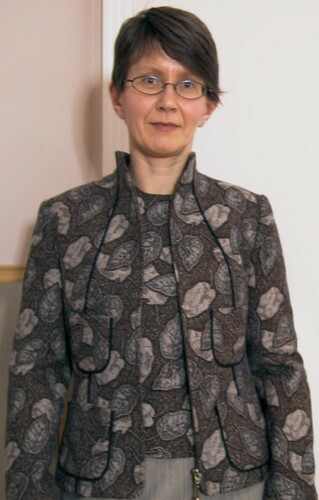 Want to see more ancient (pre-blog) projects from The Sewing Lawyer's closet? This first long weekend of the season, I have found that it's extremely pleasant to knit on the deck. Even when a tiny special stitch marker dropped directly into the gap between two cedar planks, into the inaccessible abyss below. What are the odds of that happening? Apparently 100%. However, this delightful sock is emerging. I took a day off work a week ago to learn sock-knitting from one of the masters (mistresses?) - Cat Bordhi. She's a knitting genius. Knitting a sock from the toe up, sculpting it without seams or even picking up stitches into this astonishing 3 dimensional shape, reminds me of making a shirt with every seam perfectly felled, no raw edges anywhere, entirely by machine. And for those of you who are contemplating unsubscribing to my blog in disgust at finding (again) no news of actual sewing, I promise you the machines have been in use today also. Please don't go just yet!! !